Where is memory of who we really are, who sent us here, and what is our work here … and why are we often so unusual, so different, so eccentric, so belonging often to a tribe of one? The program Mother Night presents a new series of audio teachings from the Jungian psychoanalyst and author of Women Who Run With the Wolves. This six-session learning event invites us to tap the generative power of the goodness of the core self—that is, all creativity and understanding that lies out of sight in darkness—often called the unconscious. 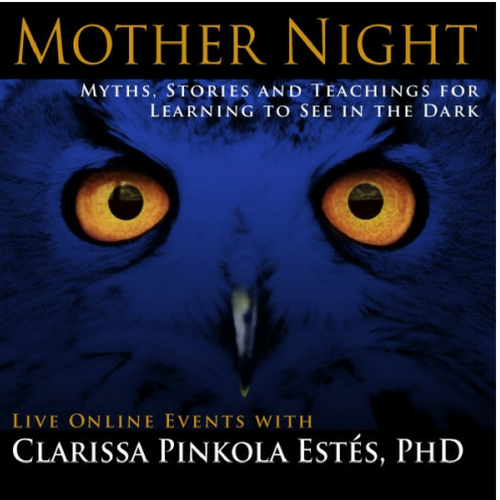 Throughout 11 hours of teaching stories, you'll hear 12 stories and myths told here for the first time along with Dr. Estés' commentary, Q&A sessions with her, and special prayers of blessing onto your hearts, bodies, minds, and souls. According to Dr. Estés, “The most endangered species on earth is the human soul. Many try to stand in one world only, the world of the collective culture, thereby experiencing a sense of standing outside the true self, allowing too much waste into one's life—due in part to over-immersion in the daytime world only. A sense of being 'not in oneself entirely' comes from not returning to the soul's true home, often enough … a home that is not provisioned nor protected by the overculture. Thus, a critical susto (loss of soul nourishment) comes upon us. We are weakly linked or severed completely from the one-of-a-kind wild and wise self that emerges from the realm of mystery, dreams, and shadow. A Q&A with audience members follows Dr. Estés’ teachings, and we conclude with the blessing prayer “Prayer for The Outsider." In Curanderismo: Allying with the Immaculate Heart for Guidance and Recovery, we explore curanderismo, the practice of the curandera, the traditional healer in native Latino culture. Dr. Estés tells the story of Los Zapatos ("Little Shoes"), and the story “The Bell Ringing Under the Ground,” along with related teachings about susto (the wandering soul), envidia (envy), and mal ojo (evil thoughts that entrap those who think them). “Knowledge of the ways the mainstream collective pollutes the true self and how to do the necessary limpias, cleansings of the mind and heart. These are the keys to creating a consciously strong allyship with the forces of goodness, as well as a code of honorable conduct for effectively helping and healing self and others. “The Littlest Lazarus,” a special blessing prayer, follows a Q&A session with the audience. In Mining the Mother Lode: How to Bring Diamonds from the Darkness (for Artists and People Who Want to Create), Dr. Estés explains why “those who unleash their craft do not wait for the muse; the muse is like one’s breath, one’s arm, one’s hips, one’s eyes … the muse is always there, waiting to spring into action if only we lay out an empty space. Seed goes first to the places which are most empty.” So here, we will see about the places of psyche and soul and both worlds that seem most empty, unknown, and inaccessible. The stories “The Man Who Sought Treasure Afar,” “The Rebbe in Prison,” and “Coyote Learns to Dance” set out insights about how the psyche taps, nudges, shoves, trying to get its person to unfurl that idea, dare that new venture, complete that meaningful project, go wild and get rid of the "high court of apes" that criticize and condemn any and everything that comes from one’s hands, feet, body, or mind. Our work is not to criticize, condemn, or complain. Our work is to do. And then do again. And again, and know for once and for all, that seeking perfection is the abject enemy of "done." Following a Q&A session with the audience, we close with the blessing prayer “Mary, Covered in Ashes; Mary, Covered in Diamonds. Back to all publications by Dr. Estés.